Research projects funded, initiated and supported by the LEUCOREA Foundation focus on the historical place of Wittenberg in the context of the Reformation, and its meaning for the formation of the modern era and of modernity. Starting in March 2009, an interdisciplinary research project at the LEUCOREA Foundation concerns itself with the historical development of the Reformation city of Wittenberg. Academic endeavours study the transformations brought about by Frederick The Wise’s accession to power in 1486: to town infrastructure, the Elector’s palace, both ecclesiastic and civic life, and to the university. These changes are studied using text sources which had previously not been evaluated, visual representations, and evidence based in archaeology, art history and architectural history. Inquiries are made into questions such as: What was Wittenberg like before Frederick The Wise? ; what was it like before the founding of the University? ; how did the city change up to 1517, and up to its defeat in the Schmalkaldic War in 1547? Research results will be published in a series of publications (“Wittenberg-Forschungen”) by the Michael Imhof publishing company. The first volume was published in 2011, entitled “Das ernestinische Wittenberg. Universität und Stadt (1486-1547)” (Ernestine Wittenberg. The university and the city). The second volume, “Das ernestinische Wittenberg. Stadt und Bewohner“ (Ernestine Wittenberg. The city and its residents), was published as two books in 2013: one text volume and one illustrated volume. The third volume, published in the summer of 2015, presents a detailed and richly documented study on the impact Lucas Cranach the Younger had in Wittenberg. In an outlook towards the year 2017, the post-graduate school Cultural Impact of the Reformation studies interactions between Protestantism and modern culture in a variety of dissertation projects. Particular emphasis is placed on processes of transformation in social life, medicine, jurisprudence, art, philosophy and theology, stimulated by the Reformation since the 16th century. Doctorate students also attend a colloquium where they acquire knowledge on the history of Protestant religiosity and theology, and take part in world convention »Cultural Impact of the Reformation«, which will take place in Wittenberg from 7.-11. August, 2017. Verena Schneider: The effects of Protestantism on attitudes in Germany and the U.S.A. The series of publications Leucorea – Studies on the history of the Reformation and Lutheran orthodoxy, edited by Irene Dingel, Armin Kohnle and Udo Sträter, released its first publication in 2001, with the publishing company “Evangelischer Verlagsanstalt Leipzig”. Publications will include monographs presenting research on the Reformation and the early modern period as well as conference transcripts from relevant conventions in the fields of history, theology and the history of science. This initiative aims to bring together the ca. 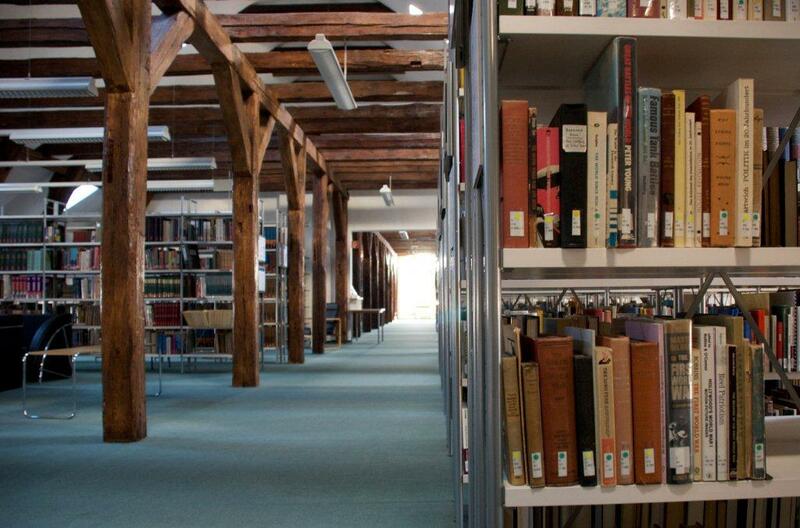 220,000 items from the extensive book collection in Wittenberg, to concentrate infrastructural and research-related opportunities and to use these synergies to impact the cultural and scientific landscape. Partners in this initiative include the LEUCOREA Foundation, the Luther Memorials Foundation of Saxony-Anhalt, the Protestant Preacher’s Seminary (UEK) and the University and Regional Library of Saxony-Anhalt. The partners are involved at different levels: they contribute their collections to the project, partially subsidize incurring costs for the library’s operation and use, provide support by means of expertise, and assist with improving the online catalogue. Its location in the palace allows the research library to be part of an ensemble of educational, cultural and clerical institutions, which advances Wittenberg as a centre for science and academics.